Set four years after the battle of Sekigahara, which is said to have split the country into two, Samurai Deeper Kyo tells the tale of Kyo the Demon eyes, a legendary Samurai who murdered a thousand men on the battle field. After which, Demon Eyes Kyo seemed to vanish from existence, in reality, he continued to live in the Medicine Man Mibu Kyoshiro. Now… Demon Eyes Kyo has awoken from inside Mibu Kyoshiro and an unkown part of Japanese history is beginning to unfold. The story is Samurai Deeper Kyo is exceptionally brilliant. When compared to other samurai anime like Kenshin or Samurai 7, this 26 anime series stands out as one of the best. Samurai Deeper Kyo starts off in the battle of Sekigahara and shows Demon Eyes Kyo fighting and killing countless soldiers, and beautifully adds some events that are basically the foundation of the story. Then, using that base, the story slowly developes and reveals more and more of the past through some great story telling. The gratifying thing about the series is definitely the fact that the story is never predictable. But of course, while the main plot moves in unpredictable directions, the various battles in the anime are somewhat predictable, especially those that feature Kyo himself. 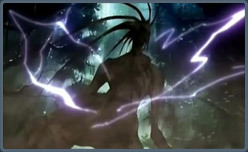 In most of the early episodes, Kyo is shown like some immeasurably powerful warrior that no one can compare to. This gives the anime a sort of Hellsing feel to it, but even still, it quickly corrects this as the anime progresses and shows that Kyo isn’t really all that omnipotent as he seems to be. The characters in Samurai Deeper Kyo are all distinct and very likeable, well most of them, if you exclude the series heroine Yuya. Kyo, the main character is most importantly presented as a kickass and cool character, who has an interesting sense of justice while still asppearing to be a powerfull cold blooded killer. 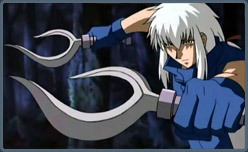 His alter ego, Mibu Kyoshiro, who only appears a few times in the series, is also pretty funny and likeable. 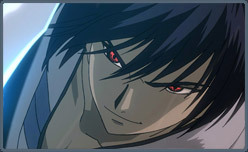 Infact, the first few episodes with Kyoshiro will have you liking him even more than Kyo at times. It’s kinda sad that such a great character isn’t give as much time as Kyo in the anime, but then again the anime is about Kyo. Leaving him aside for a moment, I’ll comment how weak a character the series heroine Yuya is. It’s so unfortunate that mostly all the characters in the cast are superbly cool with a cool personality, but Yuya just ends up being annoying, weird and unnatural. Whenever she attempts to show herself as shy, it totally contradicts her personality, and the way she expresses that feeling is in itself unnatural. Then, other than that, all her role really is in the story is to serve as a sort of distraction for Kyo and to soften his heart. She really begins to get annoying after about half the series and this does have a potential bad effect on the anime’s overall appeal. The rest of the characters, are great and distinct in their own right. Each character serves a purpose in the anime, and fulfills it darn well. While Kyo might be the coolest and most intriguing character, this anime has such a diverse and intriguing cast of characters that it’s tough to say that everyone would just be picking Kyo as their favourite. The art in Samurai Deeper Kyo is pretty good. The character designs are very very well done and give the characters a distinct feel and breath new life into an already great anime. The shogunate era of Japan is shown in a very lush and green world that really contributes to Samurai Deeper Kyo’s ancient feel. The animation for the battles is also well done, and while it may not be Ghost in the shell in terms of animation, it’s definitely got its share of memorable moments. A bit of an annoying thing about the animation though, is that some of Kyo’s killer moves aren’t shown to be that horrific as the anime implies them to be. Speaking of the battles, it is indeed a weak point of the anime that all the battles seem short and rushed. No battle lasts for more than half an episode, which is kind of disappointing since the anime handles the battles so well and integrates them flawlessly into the story. The action’s great and plentiful, but it’s in restricted and limited segments. Soundwise, the anime is decent. The soundtrack is an odd combination of ancient Japanese music and some heavey metal music. The soundtrack’s got a unique feel to it, but like most animes, this anime doesn’t have a varied soundtrack. So except to hear some of the same soundtracks over and over again. The voices on the other hand, are very very well done, and suit each character perfectly, and actually add a lot of depth to the already deep character personalities. 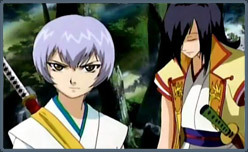 The voices of Kyoshiro and Kyo are basically one of the main elements that show how different they are from each other. 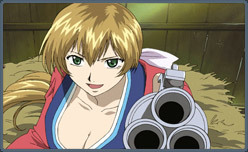 Kyoshiro has an easygoing, carefree and cheery voice while Kyo has a gruff, arrogant tone to him. 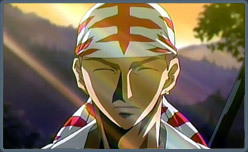 In the end, one finds that Samurai Deeper Kyo is one of the best Samurai Anime there is. It can easily out class animes like Kenshin and Samurai 7 and definitely deserves respect and praise for that alone. As an anime, it’s a nice, 26 episode series that will keep you intrigued and hooked till the end. Even the ending of the anime is unique and tends to focus on the perception of the viewer. While it’s a great anime, it’s not exactly perfect and may not appeal to a few people here and there. It’s got some flaws, that are minor ones but really deny it the A+ grade. Nonetheless, it’s a great anime and worth anyone’s time. We award it an A grade.